The Asia Briefing Business Partner Program provides an opportunity for organizations improve their visibility and expand their marketing channels in a cooperative manner. We have worked closely with numerous organizations in a variety of industries throughout Asia and other regions over the years. 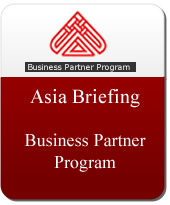 Established in 2009, the Asia Briefing Business Partner Program offers our clients an array of premium services. Bloomberg BusinessWeek is a global source of essential business insight that inspires leaders to turn ideas into action. Indian Council on Global Relations is a new foreign policy think tank in Mumbai, established to engage India´s leading corporations and individuals in debate and scholarship on India´s foreign policy. Gateway House is independent, non-partisan and membership-based. LexisNexis is a leading global provider of content-enabled workflow solutions to professionals in law firms, corporations, government, law enforcement, tax, accounting, academic institutions and risk and compliance assessment. The German company Lufthansa AG is a worldwide operating Aircraft company, which offers mobility as well as services for other airlines. The different airlines owned by Lufthansa itself position themselves as quality carriers within their market segment. Italian website publishing the most updated and accurate information on the international commerce techniques. Bi-weekly magazine, publishing articles specialized on the new regulations and statues in Europe and other foreign countries. The Wall Street Journal Asia is the leader in global business news for Asia, providing indispensable news and analysis of regional and global business developments for an influential pan-Asian audience of corporate and government decision-makers.